Joliment décoré 3 BR, 2 BA maison de seulement 1/2 bloc de la plage. Carrelage partout, jardin privatif clos avec terrasse et barbecue au gaz. Cette maison est parfaite pour les grands rassemblements de la famille ou des retraites d'entreprise. Chaque chambre dispose d'un lit queen-size Murphy lit, un bureau et une chaise, une télévision à écran plat. La cuisine moderne et spacieuse est livré avec tous les ustensiles. Il ya une grande salle de bonus avec deux supplémentaires Murphy lit queen, laveuse et sécheuse. Pour les clients corporatifs et commerciaux chaque chambre peut facilement être converti en un espace bureau / réunion. La grande salle de bonus peut être configurée comme une salle de réunion pour les réunions. La propriété est située juste 1/2 bloc de la plage et à distance de marche des magasins, y compris un grand supermarché et pharmacie, Surf Shop Ronjon, Starbucks et de nombreux restaurants. Le Cocoa Beach Pier est aussi un moyen de marche relativement courte. Enjoyed our stay. House worked great. Worked ok with 3 couples, except two bedrooms had to share a bathroom. This was the perfect house in the perfect location for our two families. There are three bedrooms on one end of the house that all have queen beds and TV's (we were so pleased to arrive to already made beds). One has a private bathroom, as well. In the middle of the house there is a large living room with two comfortable pull-out couches and a den that also had a pull-out couch. The kitchen and dining room are in that area and suited our needs perfectly. Off of the den is a huge room with two queen beds and two couches (these were not pull-outs) and a laundry room. This area was perfect for our teenagers. The house was huge and was perfect for our group of 11. The house is steps away from the beach, shops, grocery stores, ice cream shops, and restaurants which we utilized to the fullest. We arrived extremely early in the morning and were well past the 4:00pm check-in, but we weren't concerned because check-in was at the hotel. The night attendant at the hotel, though, was unaware of the procedure for check-in at the house, which rattled us a bit, but the hotel went above and beyond and gave us rooms for that night free of charge. The morning staff at the hotel knew the check-in procedure, and we were able to move to the house at that time. This all could have been avoided had we communicated that we were going to arrive quite a bit later than check-in, but everything worked out well. Just be sure to have better communication than we did with the hotel if you are going to arrive really late. We really enjoyed our stay and would definitely rent from here again. A large group of us stayed here over spring break and we loved it! It was very large (5 queen beds and so roomy!) and fit all of us comfortably. The beach was so close and we walked there everyday! It was also nice that we were able to use the pool and hot tub because of the relationship with the hotel. We also were able to walk to Ron Jon’s and many restaurants! The house was very clean when we arrived. The only thing I would say is to bring blankets, they only had sheets with a very thin comforter on each bed and it would have been nice to have blankets on there also. Overall, I would recommend this place to any large group! Perfect size house with an amazing location! There were 5 beds, a pull out bed, fenced in back yard, outside shower, large living room, and a nice size eating area. Location was perfect! 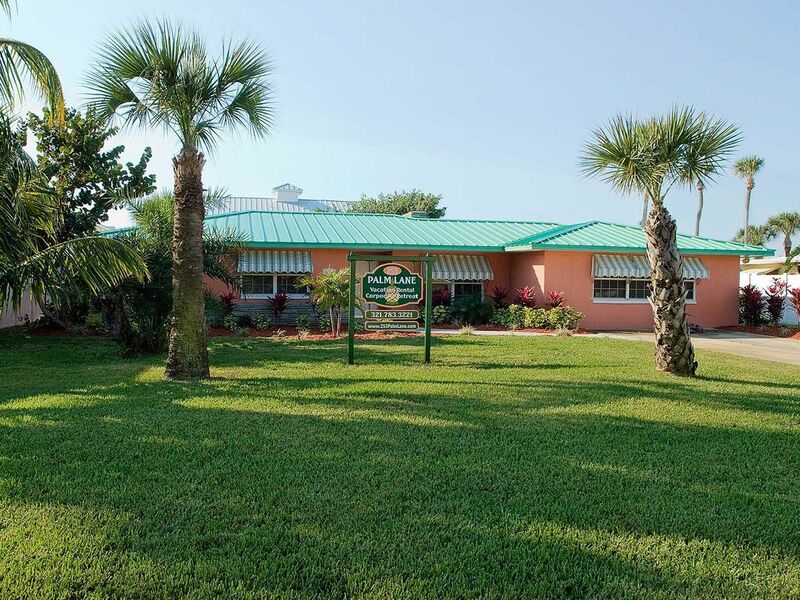 Right by the beach, walking distance to Ron Johns Surf shop, and a NY style pizza place. Their pizzas, salads, rolls, and pasta where AMAZING!!! I would recommend this to place to anyone and everyone! My family of 11 people really enjoyed our stay here. It's not a super fancy home but it has all the necessities and I consider it to be a good value. It's 1 block from the ocean, plus you get to use all the amenities of the Comfort Inn next door (pool, shuffleboard, ping pong, etc.). The kids swam in the pool all day, and the adults enjoyed the hotel bar which was right close to the pool. The location is excellent -- within a short walking distance there are numerous restaurants (we enjoyed the Thai place and the pizza place), a grocery store, and mini-golf (with ice cream). The famous Cocoa Beach pier is about a mile down the road. The backyard was a nice private spot to relax, but they could use a new grill back there (it was old and rusty). The TVs were a bit outdated (and 1 remote didn't work) but we didn't watch much TV anyway. The wifi worked great, and there were plentiful towels and dishes. Overall it was a very enjoyable stay and we will be back! Kennedy Space Center, domicile du programme spatial américain est à 30 minutes. A voir absolument quand à Cocoa Beach. Gambling croisières deux fois par jour à partir de Port Canaveral, à 10 minutes. Rates are subject to change based upon demand. Please contact me for details and rates during your desired stay dates.